Phew! The house smells awful this morning. 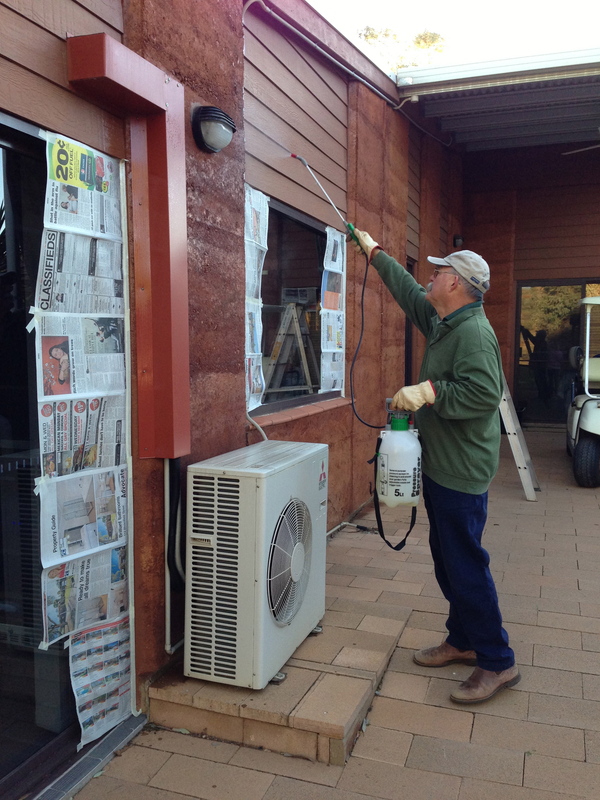 Our ‘house doctor’ is putting the sealer on the outside to protect the rammed earth. This has to be done usually around every 4 years. The product we use is called Rain Coat and it is a silicon based sealer that cleans up with turpentine. All the others we have seen are xylene based and that stuff will rot your liver! But the Rain Coat still smells when you first put it on. 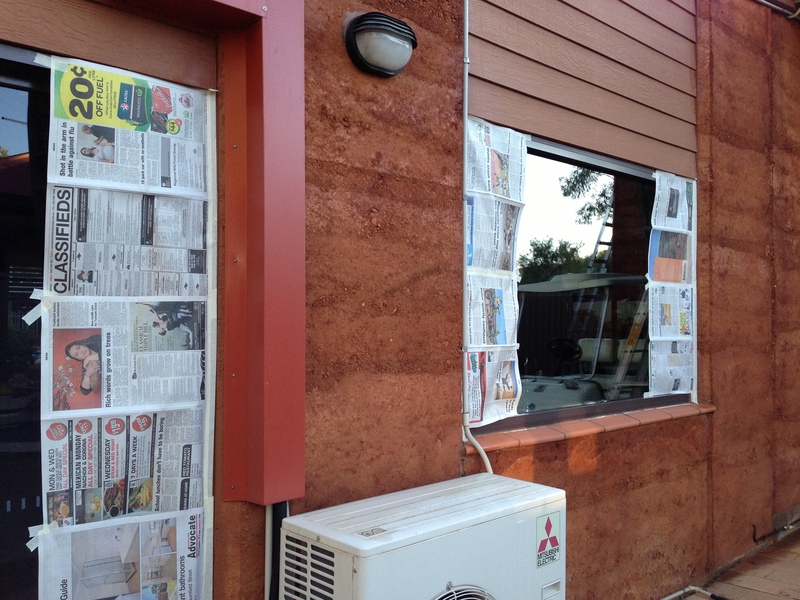 It takes longer to mask all the windows and doors than it does to actually spray on the sealer. DD (Darling Donald, Doctor Don, take your pick…) uses a low pressure garden sprayer and it works perfectly. He gives it two coats but there is very little drying time required between coats, so it is not like using acrylic paint on your walls. He does it in the winter though, because when the air is too warm application doesn’t work as well. In those days I took it for granted because once a week we could go to the markets and buy it. But then we moved to Alice 22 years ago and the only Asian food one could get here was Chinese. 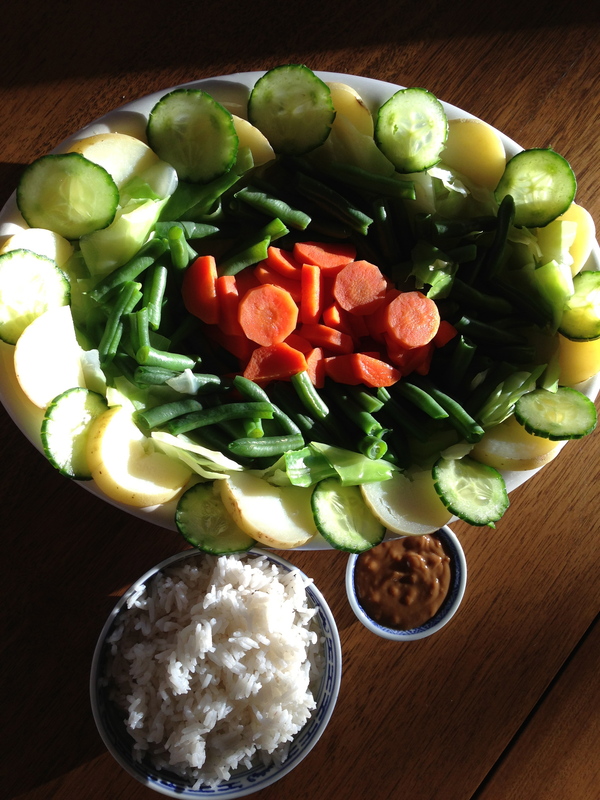 So I learned to make our own Gado-Gado, thanks to Charmain Solomon, and, as you do, modified things a bit to suit our tastes and to make it a little easier on the cook. It is not difficult, just tedious to steam all those vegetables. I share with you my time tested, okay, modified recipe, and hope you will try it sometime. It is fairly healthy providing you don’t smother things with gallons of peanut sauce, though that is very tempting. The spicy peanut sauce brings all the flavours together so nicely. Thank goodness, of all the things I am sensitive to, peanut butter is not one of them! If you want a protein component in addition to the egg and peanut sauce, cook a few chicken satay skewers on the grill, over charcoal if you can, lovely flavour! The origins of this dish are Indonesian/Malaysian. I’ve posted the recipe under the FOOD heading here on my blog, scroll down and you will see it.